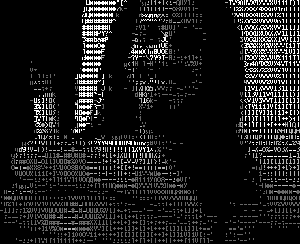 HasciiCam makes it possible to have live ascii video on the web. It captures video from a tv card and renders it into ascii letters, formatting the output into an html page with a refresh tag, or in a live ascii window, or in a simple text file. It gives the possiblity to anybody that has a bttv card, a unix box and a cheap modem line to show live (h)ascii video can be viewed without any need for extra applications, plugins, java etc. To run this software you need to have installed a working Free GNU/Linux system, like for instance dyne:bolic. You can compile HasciiCam from sourcecode or you can look into the list of packages for your GNU/Linux distribution if a compiled version is allready there. You also need to install AA-lib on your system, it is an excellent library used to convert video in ascii letters. As hardware you need to have a webcam or a videocard supported by “video 4 linux”, most of the gear you can buy around should work well. Hasciicam is written in plain C and is operated via command line, comes with a comfortable help ( -h option ) and a manual page. 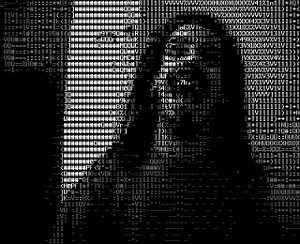 Hasciicam grabs video using Video4Linux2 api: grabs YUV420 and uses the luminance component to obtain a grayscale frame, then renders each frame into (h)ascii using the AA-lib engine, armoring it in an html with a refresh tag. HasciiCam is written in C and should be portable to various operating systems besides GNU/Linux, still you are strongly advised (is good for your karma) to use it on free GNU systems – and smoke a spliff sometimes. Many GNU/Linux distributions have packaged hasciicam ready to install. The (new) code repository is on github.com/jaromil/hasciicam.